Want to save this post for later? Click here to download as a PDF! There are many reasons you might want to make money from home. Perhaps you want a work-at-home job so you can stay at home with your children. Perhaps you already work one job and need something you can do from home in the evenings and weekends to bring in extra money. Or maybe you want a flexible job that will allow you to travel. Whatever your motivation, I want to help you find a home based job to suit you! I’ve been learning how to make money at home and online for a couple of years now, and I have plenty of ideas to share with you. Here are almost 40 different ways to make money from home. 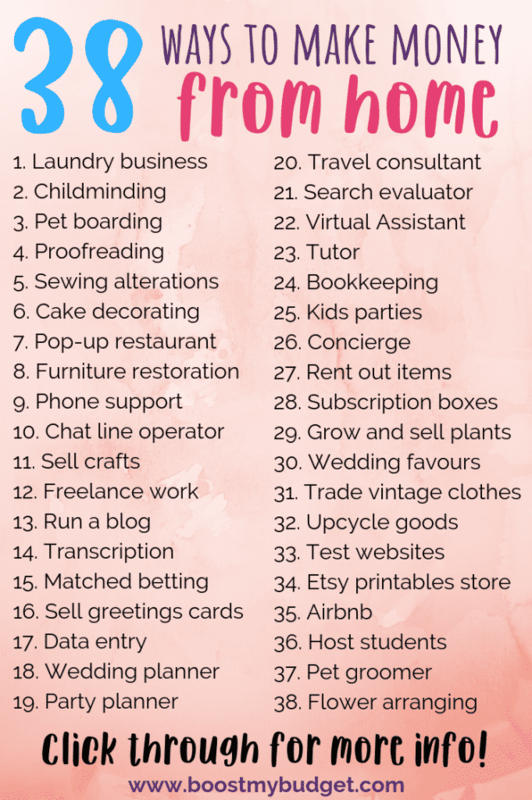 I hope you find the perfect money-making idea for you on this list! How to make money from home: 38 ideas! Please note that this site uses affiliate links. If you purchase something through a link on this page, I may earn a commission at no extra cost to you. Thank you for supporting my site! A lot of people HATE laundry and ironing. Personally, I don’t mind it. I enjoy ironing while I watch something on TV. Anyway, a lot of people are willing to outsource their laundry and ironing. This makes a great home business opportunity. Assuming you already have a washing machine and iron, there are no start up costs. You can probably find your first client just by asking around your family and friends. Childminding is a great work from home job for mums, because it provides a way to make money from home while also looking after your own kids. You could start by looking after friends’ or neighbours’ children, and maybe build up to a larger business, if you have the space. Please check if there are any regulatory and licensing requirements where you live. Pet sitting or boarding is another great fun way to make money from home if you love animals! You could take in a dog for a few hours every day while its owner goes to work, or even have an animal to stay for a longer period while its family are away. Tailster is one popular site in the UK to find pet boarding work. If you love words and reading, proofreading could be the perfect home based job for you. Most proofreaders work as freelancers, meaning that they can work on their own schedule. You can take on as many or as few clients as you like. This makes it the perfect flexible job to work around your childcare commitments or travel. If you’re interested in proofreading as a career, I highly recommend this free 76 minute introductory workshop. It will help you decide if proofreading’s right for you, and point you in the right direction to find your first client. This is another simple task that a lot of people are willing to outsource. So many people don’t know (or don’t take the time) to do minor repairs or hem long trousers. If you know how to do this, offer your services out to your local community for a fee! Are you a Great British Bake Off wannabe? Beautiful celebration cakes are always in demand for birthdays, weddings, anniversaries and more. Have you always fancied running a restaurant? Pop-up, in home restaurants are a new trend that let you make some money from your culinary skills, without the commitment. You could throw a gourmet dinner in your home once a week, or whatever you have time for. This article has more information on getting started. Again, there are usually licensing and regulatory requirements to work with food at home, so please check with the authorities in your area. If you know how to restore old furniture and make it look beautiful again, look for clients who will pay you to renovate their favourite pieces. Telephone customer service jobs are one of the most common work from home jobs. I always see lots of this kind of job advertised on job boards like Indeed. You will need a quiet space to work, so it might not be ideal if you’re looking after children at the same time. This is not for everyone – but adult chat lines can be a lucrative way to make money from home! Find out more in this interview with a woman who makes a full time income from home as a chat line operator. Are you crafty? You could make goods to sell at home. Sell your creations online on Etsy, or locally at fairs or in gift shops. There are endless crafts you can make to sell, from jewellery to keyrings to art prints to stuffed toys. I recommend browsing on Etsy for inspiration. There are so many kinds of freelance work you could do from home if you have the right skills! Common freelance jobs include writing, translating, design work, website design and programming. Popular sites to find freelance work are Upwork, People Per Hour and Fiverr. Check out this article on getting started as a freelancer for more information. I’ve been blogging for two years and it’s now my full time job! To me, blogging is the ultimate way to make money from home because it’s completely flexible. I love choosing my own hours and not having a boss. Plus, your earnings are almost unlimited, because your audience can be potentially millions of people online! Start your own blog with my step-by-step tutorial now. Transcription is another flexible job that you can do from home. You can work directly for a company like Daily Transcription, or as a freelancer. This free 7 day email course will set you up to become a transcriptionist from home. If you’re in the UK like me, matched betting is my top work from home recommendation for you. I’ve made between £300 to £600 a month in just a few hours per week matched betting, and it can be possible to earn up to £2000 a month. Matched betting is a way to make money online from the free bet offers on betting sites. It’s not gambling, because you ‘match’ your bets on two different sites to cover all outcomes. The profit comes from the free bet offers. If done correctly, you should make money every time. I use the matched betting training site Profit Accumulator which has videos and live support to talk you through it. Oh, and it’s tax free! Earn up to £45 with a free trial of matched betting this weekend. Data entry is another common work from home job. It requires little experience or qualifications. Search for home based data entry jobs on any major job site. You can also advertise data entry work on freelance sites such as Fiverr. If you love all things wedding, consider setting up a home based wedding planning business! Planning a wedding can be a stressful time, and many brides will pay to have someone take over small tasks such as researching and contacting suppliers, and organising decorations and stationery. You can do most of these tasks from home without any special set up. Similar to wedding planning, events planners help people out at a busy time by helping them create a perfect day! You could specialise in an area like children’s parties or corporate events, or keep it general. If you are organised and enjoy research and planning, this could be a great opportunity for you. Freelance travel consultants work from home helping their clients to plan a perfect trip. Your duties could be creating custom itineraries, booking hotels and travel, and advising on visa or passport issues. This is an interesting business that you can run from home, working by email or phone. Search engine evaluators work from home to help search engines improve their results. The work usually involves researching search results and/or social media. If you’re internet savvy and want a computer-based work at home job, look into the companies LionBridge and Appen. Virtual Assistants (or VA for short) work independently for bloggers and small businesses. They can take on any kind of virtual task, such as email management, social media scheduling, creating graphics, assisting with writing or editing blog posts, and more! Tutors are always in demand! If you have good knowledge of key subjects such as English or maths, you could offer private tutoring, especially in the run up to exams. Your students can come to you if you have a suitable space. Even if you don’t feel qualified to teach an academic subject, there is huge demand online to teach English as a second language. You often don’t need any qualifications or experience, as long as you are a native speaker. Some places to look for online English tutoring jobs include Education First (currently recruiting TEFL qualified teachers for £10-£14 per hour), iTalki, VIP Kids and Lingoda. Bookkeeping is another job that it’s possible to do from your home office. You should be highly organised and good with numbers. You will need professional qualifications, but there are online courses you can take. Try asking local accountancy firms if they want to outsource any work, or you could provide services to other self employed people or small businesses. Love entertaining children? Consider running children’s parties! You could offer activities such as decorating cupcakes, baking or other simple crafts. Depending on your space, you could run parties from home, travel to a client’s house, or hold the events in another suitable space such as a church hall. Concierges help their clients with tasks such as making reservations and arranging special services. There are work from home concierge jobs available for people who are organised, comfortable on the phone and who get things done! Search job sites for terms like ‘home-based concierge’ and ‘virtual concierge’. I love this idea, because it’s one of the simplest ways to make money and takes almost none of your time! If you have any kind of item that people tend to only use once – such as wedding decorations or power tools – you can rent them out for a small fee. You can also rent out items for a longer period of time. Baby equipment is a good one for this, especially if you’re in between babies yourself. Subscription boxes have been booming in popularity recently! I’ve seen subscription boxes on every theme, from stationery to socks. You can set up a subscription box business from home. It looks like fun sourcing different items every month! Here’s more information on how to get started. Houseplants are also having a moment right now. If you’re green fingered, you could grow plants at home and sell them. Perhaps you can sell them at local markets, or a local shop might let you have a stand outside. Some sturdier plants, like succulents, are even suitable to sell online and send through the post! Everybody wants new and inventive wedding favours. This could be a cute way to make money from home! Wedding favours can be as simple as a bag of sugared almonds with a personalised label, or something more creative like plants, jams, soaps or individually decorated cupcakes. You can find business at wedding fairs or by advertising among your community. There is a huge market for vintage clothing, but a lot of people don’t know its real worth. If you know your fashion, you can make a living from home by buying old clothes on eBay, charity shops or boot fairs and reselling online. This is how Sophia Amoruso from Nasty Gal got started, and she turned her eBay shop into a multi million dollar business! Clothes aren’t the only second hand item to buy and sell. Old furniture can be worth a lot more money if you fix any damaged parts and give it a new lease of life with some chalk paint or wax. You can often get old furniture cheap or even free on sites like Gumtree and Freecycle. You can then upcycle for profit. This is an easy way to make money online. Companies like User Testing pay people to test out their clients’ websites or apps from home and provide feedback. You don’t need any special computer knowledge: the companies want to know how their sites work for normal consumers. This pays around $10 for a 20 minute test and you might only get one or two tests a day, so this isn’t a full time job opportunity, but can be a good way to make some extra cash. Printables are HUGE on Etsy – just take a look! You can design and sell printable products on any theme. Once sold, the customer just downloads and prints. There are no shipping costs or trips to the post office for you. Popular categories include art prints, journal pages, calendars, colouring pages, baby shower games, household organisation binders, and more. You don’t even have to have great design skills – simple products sometimes do well, and there are free programs like Canva you can use to create your printables. This is a simple home business that you can start for free. Renting out a room on Airbnb is an awesome way to make money at home, from your home if you have the space. Don’t worry about not having the perfect designer suite for your guests. There’s plenty of demand for lower priced, simple, single rooms too. As long as you have a spare bed, you could try this. If you do have that extra space, one alternative to Airbnb is hosting foreign exchange students. You could host a student for a full year, or for a shorter period. Some areas have a lot of foreign students on short-term language programs in the summer, which could be a great way for teachers to earn some extra cash during their quiet period. Depending on the program, you might be required to offer one or two meals a day, and possibly simple English lessons in addition to accommodation. These programs are often local, so check with local schools, universities or language colleges about demand in your area. We talked about pet sitting, but another way to make money with animals is dog grooming! If you already have a pet of your own, perhaps you already have all the equipment and skills, and you could offer your services to a friend with pets to get started. Flower arranging is a fun home business idea. You may have to get up early and travel to flower markets to source the freshest blooms, but then you can do the arranging from home. We will never run out of reasons to need greetings cards. If you have an artistic side, you could produce your own range of greetings cards from home. Thanks Grainne! Haha I’m not good with animals myself but I love the idea of pet grooming as a side hustle for somebody who is!